In 1947 a team of Russian Archaeologists uncovered a tomb in the Pazyryk Valley in the Altai Range in southern Siberia. When carefully excavated and freed from the ice, a superb woollen rug was found almost completely preserved. It is now kept in the Hermitage Museum in St Petersburg. This ancient relic confirms that, incredible as it may seem, little has changed in basic hand knotted rug manufacture over as much as twenty five centuries. Your oriental rug is a direct descendent of the Pazyryc Rug and should be treated as something special. 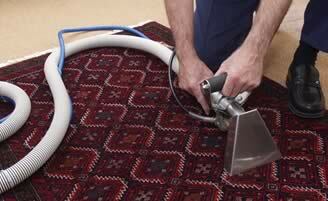 When cleaning a hand knotted rug there are many considerations to take onto account. Will the colours run, will the rug shrink, will the stains be removed? These are but a few of the problems that can occur during the cleaning process. That is why we always inspect and test the piece before cleaning your oriental rug. We shall explain the method of work and carry out the job to your satisfaction.